Latest great guest post from our email experts Pepipost. By Akshay Tiwari Marketer|Blogger|Growth Hacker for Pepipost. It’s 2017 and email continues to dominate. That’s a given. It’s no longer about whether email is dead or not. Rather it’s about how email is evolving in the wake of new channels and changing customer behaviours. 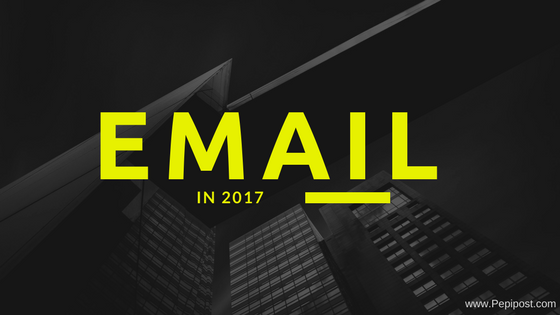 So let’s take a look at what’s in store for the email industry in 2017. The world now needs constant access to their emails, on the go. Here’s where mobile phones wearables come into the picture. People have moved on along with time. That day is no far when people will wear their emails. According to reports, wearables are estimated to be the most sold product in the consumer electronics segment, and surely no ESP wants to lose out on them. Hence, ESPs are working on two major aspects to increase customer satisfaction viz., the app which is compatible with different wearables and making their emails responsive. As the year progresses, Gmail is looking to add a couple of important arms to their mailing service, webmail clients style support and media query support for mobile applications. These will ensure improved user experience across platforms. Modular templates are a more controlled manner of delivering dynamic content to the customers. A created content module can appear differently, identically or may not appear at all in the audience. How to set up a modular template design? US election email hack saga has surely let ESPs to relocate email security in their priority list. Living in a world that makes us very exposed to online predators, who search day in & out to hook on your identities, social security numbers, account numbers and various forms of sensitive/confidential information. This shows how prime your emails are. The alarming part being that traditional emails are not discarded/deleted from the unsecured servers. This is why it’s organization’s responsibility to make their data secured from such threats. The trend of using animation and video in emails will continue in 2017. The concept here is to make animation in such a manner which supports the content rather than dumping some irrelevant animations. Talking about expecting something new, we can surely expect some more supported media file types for direct attachments. The timeliness, customizable and relevant behaviour of triggered emails is an asset to the marketer’s automation toolkit. From welcome greetings to cart abandonment notification, triggered emails are present everywhere with their ever increasing scope. There is no harm in expecting bots to operate an email marketing campaign which is full of automated and triggered messages. Some automated tasks like sending confirmation emails, abandoned cart emails can be bot handled based upon the data processed from the chat sessions. This can be the announcement of Artificial Intelligence in email industry, which is the new hit. It is the systematic approach and imaginative focus that makes an email channel steer away from others. With frequent updates in technologies, email industry is the most transforming sector of digital marketing.